Our rescheduled February work group took place on 21 February, Our main focus was soil sampling with Steve Peel. We took soil core samples across a range of different habitats. Analysis of these samples we will give us a better idea of the suitability these areas for introduction of more native species either through seeds or plants. We also spent time building up the dead hedge by the entrance fence, clearing the paths of bramble, hawthorn and willow and lastly restoring the area that has been damaged by bottle diggers. It’s very frustrating to see the damage that has been done in area that’s very important for our colony of rare White-letter Hairstreak butterflies. 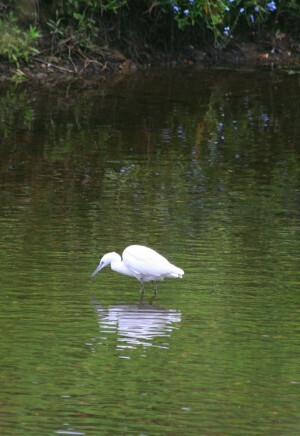 Following some good records in 2014 we have had regular sightings of 2 little egrets on the river and opposite bank since the beginning of February – who knows may be they could be back and breeding in Wharefdale for the fist time in a very long time. With sightings of pairs of goosander, dipper and oystecatcher spring is here! the next work party is set at February 21st. Meeting as usual at the lay-by on Coutances Way – 09:30. Feel free to join in. We have had to cancel previous work parties due to the weather in January.